One of the most popular sport fish in the northern and central United states has developed a similar reputation in Washington in the last couple of decades. Known for its exquisite flavor and large size, this newcomer called “walleye” is providing additional excitement and opportunity in a state already rich with fishing resources. A good day’s fishing for walleyes will yield several two-to-three-pound fish, with an occasional fish up to ten pounds. The current state record, caught in the Columbia River below McNary Dam in April 1990, weighed 18 pounds and 12 ounces. While walleyes are a favorite game fish for many anglers, they also can pose challenges for fisheries managers. A voracious predator, walleye introductions into some waters can impact populations of other game fish. Because of this concern, fisheries biologists in Washington are cautious managers when it comes to walleyes. A study conducted on Lake Umatilla (John Day Pool) on the Washington-Oregon border documented that somewhere between nine and 19 percent of the juvenile anadromous fish in the reservoir were eaten by other fish. Of these, 78 percent were eaten by squawfish, and only 22 percent were eaten by walleyes, smallmouth bass and channel catfish combined. In the past, when it became necessary to supplement walleye populations in lakes, the Department of Fish and Wildlife would acquire eggs from other state’s fisheries agencies (Minnesota, North Dakota, South Dakota, etc.). However, recent advancements in Washington’s walleye culture efforts may soon eliminate the need to import walleyes from other states. Walleye fry, whether acquired from other states or “home grown,” are stocked into selected lowland waters such as Sprague Lake, Banks Lake and Billy Clapp Lake. How They Got to Washington ; The walleye is not a native Washington fish, and just how walleyes originally entered the state is unknown. The first verification of a walleye in Washington was in 1962, from Banks Lake in eastern Washington. Soon afterwards, populations began to show up in Franklin Roosevelt Lake (connected to Banks Lake through a huge pipe and pump). Since then they have spread from these original sites to the remainder of the mainstem Columbia river, from near the mouth to the Canadian border. 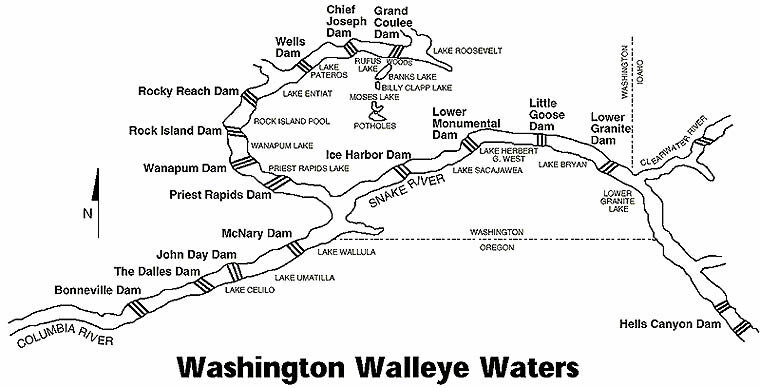 Walleyes continued to advance to other waters in the central Columbia Basin. Using irrigation canals as frontier highways, they have established populations in Moses Lake, Potholes Reservoir, Billy Clapp Lake, Long Lake, Crescent Lake and Soda Lake. The Department of Fish and Wildlife has also stocked walleyes in some of these lakes to supplement the populations, as well as to create a new fishery in Sprague Lake. The walleye’s appeal is certainly not its lethargic fight, although fish get so big here they can generate intense interest and excitement. Rather, it is their performance at the dinner table that keeps anglers returning, trip after trip. Many people consider walleyes to be the best-flavored white-fleshed fish in freshwater. Aficionados of yellow perch (a close relative of the walleye) might disagree, but not vociferously. Both are superb in a number of recipes with the walleye’s larger size contributing bigger portions. Walleye Characteristics ; When walleyes reach maturity, they become highly migratory. As soon as the lakes and rivers begin to warm and thaw in early spring, walleyes make spawning journeys from their winter holding areas. Some of these migrations will cover dozens of miles to headwater tributaries. Other spawning may occur along shallow rocky lake shores, but in either instance, spawning areas are less than five feet deep. The only proven natural reproduction of walleyes in Washington is in Roosevelt Lake and intermittently in Lake Umatilla (John Day Pool). During spring spawning runs, walleyes stack up in headwater streams and below dams and are easy prey for anglers-in-the-know. Most of the famous walleye holes throughout the country are these types of waters. After spawning, walleyes will return to the main lake or river, staying in the shallows throughout the spring and early summer until the waters warm, then moving to deep, cooler water during the day, returning to feed at dusk. During winter, it is generally thought that walleyes hold up in deep waters until the spawning urge strikes again, but little is actually known about the winter habits of this fish. One characteristic that helps identify the walleye is its large, opaque-white eyes. This feature is an adaptation to the fish’s habits and preferences, and a clue for the perceptive angler. The large eyes have extremely fine light receptivity to see prey in dimly lit waters. Walleyes evolved in turbid waters and in deep lakes and this ability to “see in the dark” has provided the necessary edge to survive. Astute anglers know that this also means walleyes stay away from bright, sunny waters. When they have to come up to the surface or to shallow shore areas to feed or spawn, walleyes look for muddy waters or they wait and move in from dusk to dawn. This is the best time to fish for them. Fish Management Considerations, WDFW ; Until 1985, statewide regulations for walleye fishing were simple: a daily limit of 15, of which no more than five could exceed 20 inches. But early in the 1980’s, as pressure increased on the fish, biologists began to notice a drop in the quality of fish caught in Roosevelt Lake, the state’s top walleye producer. Average size of walleyes caught by fishermen steadily declined from 18 1/2 inches in 1973 to 13 1/2 inches in 1985. In 1985, regulations for Roosevelt Lake were changed to try to reduce this trend. The daily limit was reduced to eight, and a minimum size limit of 16 inches was established. The following year, limits on the state’s other walleye waters were reduced to five fish per day, with an 18-inch minimum size limit. In the spring of 1990, regulations at Roosevelt Lake were changed again, after it became apparent that the 16-inch minimum size limit was giving too much protection to small fish. Fish below 16 inches were becoming quite thin, and growth had slowed markedly, due to a lack of forage to support the growing population of small fish. The present regulation at Roosevelt Lake is a “slot limit”—only fish less than 16 inches or more than 20 inches may be kept. The daily limit remains at eight walleyes, but only one of the fish in a limit may be over 20 inches. This regulation has been working well, and the average size of walleyes in the catch has been increasing. The same size and limit rules apply to these Roosevelt Lake tributaries: Kettle River arm from Burlington-Northern Railroad Bridge at Twin Bridges, upstream to Napoleon Bridge; SanPoil River arm upstream from Manilla Creek; and Spokane River arm from SR25 bridge upstream to Seven Mile Bridge. The season is open year-round in Roosevelt Lake, but closes from April 1 to May 31 in the Kettle, SanPoil and Spokane River arms. In Yakima County, I-82 Ponds 1 and 2 are closed to walleye fishing, and in Grant County Alkali Lake is closed to fishing for walleyes. These closures are to allow the department to conduct research and studies on walleyes. ROOSEVELT LAKE: Washington’s first walleye lake remains an important one. The best walleye fishing is in the Spokane River arm, followed later in the year by the northern part of the reservoir near Northport and Hunters. Roosevelt Lake’s walleye production is important to most of the other walleye fisheries in the state. To protect some of the large fish and to improve the quality of fishing, a seasonal closure has been established on the Spokane, SanPoil and Kettle River arms from April 1 through May 31. Fishing on the rest of Roosevelt Lake and the mainstem Columbia is open year-round. Be sure to check the regulations pamphlet to make sure this hasn’t changed. Access to the Spokane arm is available at Porcupine Bay and Fort Spokane, approximately 20 and 24 miles north of Davenport, respectively. Access to the upper part is available at Hunters Park and Gifford. BANKS LAKE: Located in an old glacial channel of the Columbia River, Banks Lake is producing fat, fast-growing walleyes. Access is available at a number of sites on the south and east shores, from Coulee City to Electric City. RUFUS WOODS LAKE: Immediately below Grand Coulee Dam there is some fairly good walleye fishing. Biologists report that the fish are larger now than before the 18-inch minimum size limit. Access to this stretch is available off State Route 155, at Seton’s Cove, three miles north of Elmer City. The only other access to this lake is on the lower section near Chief Joseph Dam. LAKE PATEROS: Walleye productivity below Chief Joseph Dam has been low in recent years, but dedicated anglers may find the tailrace a sleeping giant during spring spawning runs. Access to the tailrace can be found in Bridgeport. LAKE ENTIAT: The tailrace below Wells Dam has also been a slow producer in recent years, similar to Lake Pateros. Access is very limited, but a few knowledgeable anglers avidly fish this area. ROCK ISLAND POOL: A limited walleye fishery exists in Rock Island Pool and in the tailrace below Rocky Reach Dam. Access to the reservoir and tailrace is available near Wenatchee. WANAPUM POOL: Walleye fishing has improved recently in Wanapum Pool, from Vantage up to the tailrace below Rock Island Dam. Fair fishing occurs year-round, with peaks in November-December and February-March. Access is a problem, however. The closest boat ramp is at Crescent Bar, 14 miles below Rock Island Dam, with three others at the lower end of the reservoir near Vantage. PRIEST RAPIDS LAKE: A small walleye fishery exists below Wanapum Dam, and a boat launch is conveniently located at the Wanapum Dam Tour Center. A limited fishery also exists below Priest Rapids Dam, but access is poor. There is a restricted-use boat launch at Vernita Bridge, and the next access is near White Bluffs. Boaters and bank anglers should watch for rapidly fluctuating river flows. LAKE WALLULA (above McNary Dam) and HANFORD REACH: The only walleye fishery in this area is adjacent to the Hanford Reservation, for a few large fish. Boating the channels, however, can be treacherous. LAKE UMATILLA (John Day Pool): Large walleyes are the target of anglers in this stretch. Best fishing is from Paterson Slough upstream to McNary Dam. The current 18+ pound state record walleye was caught in this area. Access is available near Plymouth Park. LAKE CELILO (above The Dalles Dam): Biologists feel that there are a fair number of walleyes below John Day Dam, and this is a favorite spot for Washington and Oregon anglers. There is a boat launch just downstream of John Day Dam, and another near Maryhill. BONNEVILLE POOL: This is another possibility for walleyes for Washington and Oregon anglers, particularly in the upper portion near The Dalles Dam, and in the Stevenson and Wind River areas. Access on the Washington side is available in Bingen, along Highway 14 at Drano Lake, at Waterfront Park near Carson and at Sailboard Park in Stevenson. LOWER COLUMBIA RIVER: Walleyes are being caught in the Columbia River from Bonneville Dam almost to Ilwaco. The number of fish being caught is limited, but the fish are large. Numerous access sites exist along this stretch of the mighty Columbia, including: below Bonneville Dam, at Beacon Rock, in Camas, Vancouver, Kalama, on the Cowlitz near Kelso, and at Cathlamet. MOSES LAKE: Reports from fishermen indicate that there are a lot more walleyes in Moses Lake than in recent years. A survey conducted in 1988 found many small, but fat and fast-growing fish. Located adjacent to the city of Moses Lake, there are several nice access sites here for fishermen to use. POTHOLES RESERVOIR: Located south of Moses Lake, this lake also has good walleye potential. There are several boat launches available on the south end around O’Sullivan Dam. Walleyes can also be caught in several of the Seep Lakes below Potholes. The best are Soda, Long and Crescent Lakes. Boat access is available on Soda and Long Lakes. BILLY CLAPP LAKE: Located east of Soap Lake, this lake’s walleye fishery is similar to Banks Lake, and may get walleyes migrating from Banks Lake through the canal. Access is available on the south end, off state highway 28 as well as at Summer Falls State Park on the north end. SCOOTENEY RESERVOIR: Situated between Othello and Mesa near state highway 17 in Franklin County, this component of the Potholes canal system provides fair fishing for walleyes up to eight pounds. Two boat launches are available on the reservoir’s south end. SPRAGUE LAKE: A walleye fishery is developing in Sprague Lake, following the highly-successful rehabilitation of this system in 1986. Located near the town of Sprague within sight of Interstate 90, this is becoming one of the best all-around fishing lakes in the state. Access is available on both sides of the lake. SNAKE RIVER: A few walleyes are caught in the Snake River below Ice Harbor Dam, but little is known of the extent of this fishery. 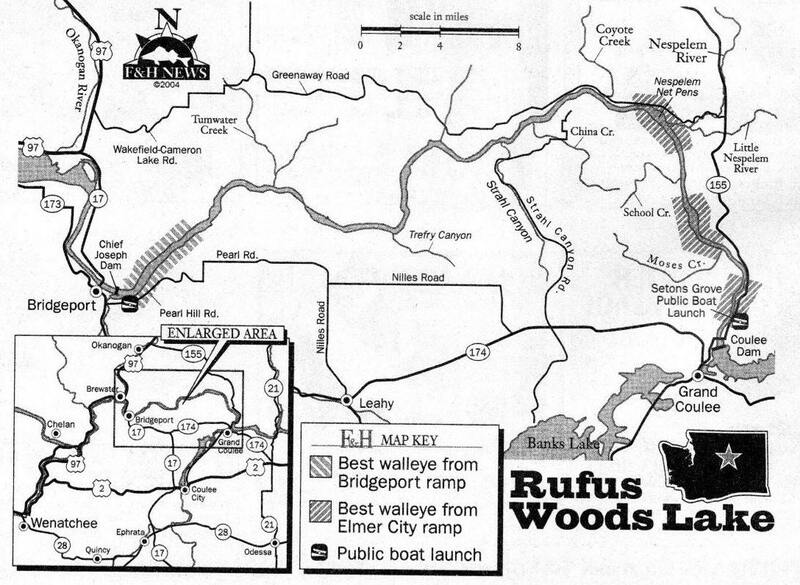 Best bets for finding walleyes are the areas below the dam in the spring. Three access sites are available at the confluence of the Snake and Columbia Rivers near Highway 12, southeast of Pasco. How to Fish for Walleyes ; There are three secrets to catching walleyes (at least): fish on the bottom; fish slowly; and use night crawlers or a imitation bait. The first two of these are the most important. Walleyes stay close to the bottom, and they don’t spend a lot of energy chasing their food. The most consistent fishing depth during daytime is 18 to 25 feet. Rocky bottoms are usually preferred, with a nearby depth change or “breakline” a desirable feature. Good catches can also be made in or around weed beds at certain times. Probably the easiest and most productive fishing technique is to use a walleye spinner/worm rig below a bottom-walker. The advantages of using this type of rig are that it keeps the bait down near the bottom where the fish are holding/feeding. And you can add color, motion and floatation to your presentation quickly if needed. You have a choice of several brands of worm harness rigs which all work well. One favorite is the Walleye Magic because it has a buoyant body to help float the bait off the bottom. It also has a spinner blade which can be had in a variety of colors. Some of the tournament walleye fishermen keep it simple by putting a #8 or #10 Spin-N-Glo on the leader ahead of a double hook worm harness. Many of them also have done testing as to decide whether a real night crawler or a fake one is more effective. The results seemed to be that it really made no difference. Most fishermen prefer a 36″ leader between the worm rig and the bottom-walker, however do not hesitate to go another foot if you are not getting a bite. As for colors, this may change from year to year or even day to day. Sometimes chartreuse or chartreuse combinations is the go to color, then don’t overlook orange or fire tiger. A good walleye rig is one that can be cast or trolled slowly along the bottom without getting hung up too often. Although not necessary, a stout wire leader 12 inches above the hook will protect the line from abrasive rocks, and will keep the walleye’s sharp teeth from cutting the line once the fish is hooked. But heavy leader may also make your offering less attractive to the fish. Large deep-diving plugs can also a popular and productive technique. These are usually in bright colors that will show up in the depths, and are trolled without any bait attached. Whatever bait or lure is used, it’s important to fish very slowly. Some anglers even troll in reverse (when it is safe to do so) to get their speed down to what a walleye will chase, or use a electric trolling motor. Once a walleye is caught, continue fishing the same area. Where there is one there will usually be more. Also make note of the bottom or “structure” and look for fish in similar habitat. One final tip is to keep the hooks razor sharp. In addition to a mouthful of teeth, walleyes have a hard, bony palate to protect themselves from the spines of the fish they eat. A sharp hook is mandatory to getting a solid hookup. Your weight does not have to always be ON the bottom, but should at least tick it occasionally, just so it is very close to the bottom will be fine. And when trolling, every few minutes, drop your rod down to see if you can still feel the bottom, if not let out more line. Here is one place where watching your depthfinder will pay huge benefits when the water depth changes. Or if you see on the screen fish on/near the bottom in 10 to 20′, the chances are good they are walleye. Drop a spinner and bait down then be ready for a bite. If they don’t bite, change color of the blade or body. If you feel a fish bite, it seems it is has not been hooked, drop the rod down or feed the fish by letting out a little bit of line. 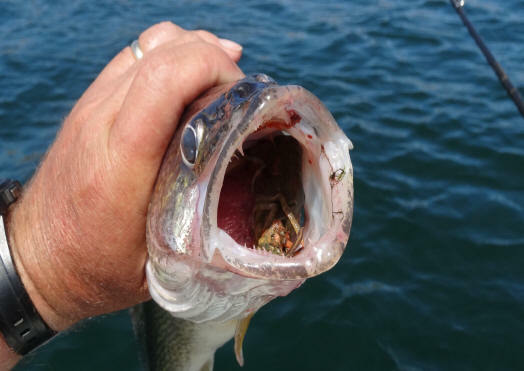 Many times it will come back and bite again if you are using artificial bait you will have another chance of hooking it. Rules for walleye fishing contests are consistent with statewide walleye regulations, except as shown below. For more detailed contest information, write the department and ask for a copy of WAC 232-12-168 and Amending Order #577. SIZE AND BAG LIMITS: All current size and bag limits remain in effect during contests, except that contest directors or their designees may exceed possession limits only for the purpose of transporting fish from a weigh-in site to an open-water area for release. During transportation, the transport boat must not leave the water the fish were caught from, and a copy of the contest permit must be on board during actual fish transport. LIVE RELEASE REQUIRED: In any contests targeting walleyes, all live walleyes must be released alive into the water from which they are caught after being weighed and/or measured. At the end of each day’s competition, if the mortality of target fish caught that day exceeds 10 percent, the contest must be suspended. Suspended contests may be continued (within assigned permit dates) only if the cause of the high mortality can be positively identified and ceases or is corrected by contest officials. Contests involving only juveniles are not required to meet the 90 percent live release requirement. INCIDENTAL CATCHES: Only those species listed as a target of the contest may be retained by participants. This means you cannot keep bass, perch or any other non-targeted species if you are fishing in a walleye contest, and cannot keep walleyes caught while fishing in a bass or other contest. Fishing the Columbia River ; John’s presentation was with safety in mind and for the average boat, not a special walleye outfitted boat. It is recommended that a boat of at least 14′ be considered. He recommended your first attempt at walleye fishing to be in the upper Columbia River near Umatilla/Boardman Oregon. The states of Washington and Oregon have what is called “shared jurisdiction” as far as fishing is concerned. This means you can fish the Columbia river FROM A BOAT in any area that the 2 states share the river as a boundary with a license from either state. You can also launch your boat from either state and bring your catch back to THAT launch. You however can not fish from the shore of the state that you do not have a license for. You can not fish the tributary rivers of the other state either. His rod / reel selection would be the same rod as you would steelhead with, 7 1/2 to 8 1/2′. Reel would be a level wind star drag of the Ambassador class. Line of 15# should be about right. Mono is fine, however some may prefer the spectra type lines. Troll downstream using a bottom bouncer wire/sinker unit, sinker weight should be 1 to 3 ounces. Behind this attach a walleye spinner harness or wedding ring unit back anywhere from 18″ to 40″. Hook a large night crawler onto the front hook with the rear hook embedded into the worm, with the worm trailing straight back. Scent of perch or anis oil may be applied. Troll slow, you may have to kick the trolling motor out of gear or use a bucket to slow you down. Many fishermen use an electric trolling motor. The take down will probably be a simple tug/tug, hang up type. This type of fishing you do not want your rod in the holder, have it in your hands for a faster response. Plus since you want it on the bottom all the time, you will constantly need to be letting it out a few feet or reeling it in to adjust to the bottom contour. And the new line-counter reels can come in very handy here. When you get thru with your pass, then turn around and troll upriver. But on the upriver troll, change the lure to a crankbait plug. This will be in the 5/8 ounce size and about anything in the shad configuration seems to work. The takedown on this will be more aggressive that the downstream worm. The minimum size is 18″, with limit of 6 fish, with no more that 2 over 24″. His estimation of the table fare of walleye would be about like a halibut. It is recommended that you take at least a couple coolers for ice to keep your bait, fish, and bring home fresh watermelon that is grown in the area. There are walleye all the way downstream to the Longview area, with a goodly concentration near the Hiway 205 bridge. However the river here can get effected by the weather more than this upstream suggestion. Plus downriver you will be into more recreational and commercial boat traffic, AND a longer way to go to get back to the launch if weather gets bad.